AT last, the Yumthang they speak so glowingly about! 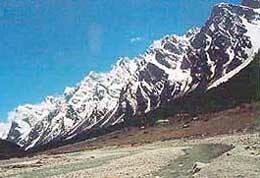 I had been to this spectacular north Sikkim mountain valley twice before, but its legendary beauty always eluded me. Not this time. Last April, as my wife and I drove through the rhododendron forests into the 11,800-foot-high glen, we were truly awestruck. The bright morning sun that I missed on my earlier visits, the sloping green valley, the gushing stream below and the snowy peaks all looked magical! It has been called the Switzerland of the East, and not unjustifiably. 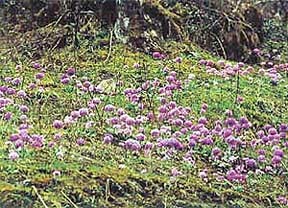 By mid-April the primulas are in bloom, carpeting the valley with millions of mauve flowers. Towards the west, the snowy mountain range, its line of jagged peaks in no apparent altitudinal rivalry, restrained as though by peer pressure. Not so the towering peak far in the north, but to the east, a distinctly modest range, its slopes darkly wooded, snow only on the summits. And down below, the shallow meandering river, the pebbles on its bed shining under the clear, fast flowing waters. I remembered my first visit to Yumthang back in April 1994, a year after the valley had been opened to tourists. We had set off from Gangtok at 4 am; it was a clear day but by noon, when we reached Yumthang, clouds clung to the western snowy range and there was no sun. Even so we were mesmerised and firmly vetoed our guide’s plans to head back for Gangtok after lunch. Lunch was a half-cooked khichri, prepared in a pressure cooker (at that height it is hard to get water boiling) by an amiable pigtail-sporting herdsman, the only soul in the cold windy vale, who grazed a herd of yaks. After several blissful hours in the enchanting valley (and a walk up to Yumthang’s famous hot spring in the rhododendron forest), we drove down to Lachung (8,500 ft), 25 km away, the only major settlement in the mountainous area. Now chock-a-block with hotels, Lachung back then had just one lodge, the log-hut-like Alpine Resort, and it was full up. So our guide tried a private house and while the housewife (dressed in the traditional boku) was all too willing to put us up for the night, her husband would have none of it. There was no family discord over us, however. In the next house; we were warmly welcomed and invited to spend the evening in the living room beside the kitchen fire. Living rooms in Bhutia homes (most North Sikkimese are Bhutias, Buddhists of Tibetan origin) serve also as kitchen and dining place; it’s where the family spends most of its time. Racks lining walls display rows of Tibetan lidded cups, large Chinese flasks and other crockery and metal utensils. There is always a big samovar with boiling water or salty Tibetan butter tea, and, of course, large bamboo mugs for chang. Chang, the local alcoholic drink, is made of fermented millet, the mugs, filled with the millet, are periodically topped up with hot water as you sip from a bamboo straw. That evening we sipped a lot of chang as our host spoke about local customs and lifestyle. The Lachungpas, as the locals call themselves, are ruled by Pipons, headmen who control the Dzumsa, a Panchayat-like governing body. Here, in this remote mountain country, Indian law holds little jurisdiction. Despite a police post, it’s the Pipon who adjudicates over most disputes and crimes, we learnt. Eventually dinner was served, compared to the half-cooked lunch at Yumthang, it was indeed a hearty meal. Next morning, as we opened the bedroom window, the view just took our breath away. Tall spectacular snow-capped mountains towered on either side, one soaring cliff reared above the village, standing sentinel over the hamlet, as it were. We had little idea Lachung was so beautiful, the previous afternoon, overhanging clouds had hidden the snowy ranges from view. Eight years later, last December, during my second visit to the area, we actually climbed one of those snowy ranges, driving up to Katao, 32 km east of Lachung and over 14,000 ft above sea level. The road took many zigzag turns as it crossed the tree line, the views getting ever more amazing with each hairpin bend. Icicles glistened in the sun, patches of snow on dried brown grass made pretty mountain slopes look wondrous, the pine forest below ranged dark and mysterious while high above, ridges, summits and troughs, all clothed in thick snow, seemed like one vast Elysian dreamland. But it was when Kanchenjunga came into view that we were the most enthralled. 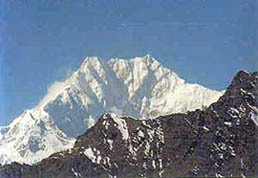 Gradually, as we gained height, the colossal east face of the massif emerged on the western horizon, a flat-topped snow-clad hulk, looking very different from the twin pinnacles of the south face visible from Darjeeling, Kalimpong or Pelling. For a long while we savoured the spectacle, gazing at (and photographing) the world’s third highest peak (28,200 ft), some 65 km away as the crow flies, even as an icy wind chilled us to the marrow, my thermometer recording –5`B0C (at 11 am). Back in our unheated hotel room at night, the temperature climbed no higher than 1`B0C. Coming straight from the comfort of the Nor-Khill in Gangtok, a former guest house of Sikkim’s erstwhile king and arguably the state’s best hotel today with a wonderful garden, that was rough going, indeed. But fun too, especially because the Lachung establishment was also residential with a typical Bhutia living room where boarders weren’t unwelcome. No such luck last April though; the hotel where we stayed was on the fringes of Lachung, at its highest point in fact, but it was a plain lodging house with no living room. But luck was with us where it mattered most last April: there was a clear blue sky and brilliant sunshine at Yumthang. The rhododendrons were not all in bloom then though, especially the pink ones (though some of the reds and violets were), but that was compensated by the snowy views we got in Yumi Samdong, perhaps the highpoint of our April tour. Yumi Samdong is a good 15 km north of Yumthang and over 2,000 ft higher in altitude. The road follows the Yumthang Chu river, climbing rapidly and soon passing the tree line. In April the snow had not yet melted and all along the route beyond the tree line, weird snow shapes lined either side of the road, seeming like an array of white ghosts. Access: Gangtok is a 4-hour (120 km) drive (taxis, shared jeeps and buses) from Siliguri, the north Bengal hub with rail and air connections to Kolkata, Delhi and Guwahati. 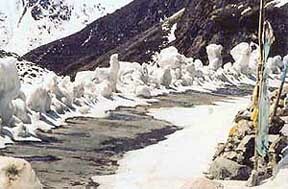 Visits to Yumthang require permits and are organised by Gangtok-based tour operators in package systems. A typical two-night package, costing about Rs 10,000 for 2-3 people (Rs 15,000 for 6-8 people), includes food and lodging (in Lachung) apart from transportation by Mahindra Marshall jeeps from Gangtok (117 km to Lachung, around 6 hours) and visit to Yumthang. Trips to Katao and Yumi Samdong are cost extra. Accommodation: Gangtok has scores of hotels to suit every pocket. The oldest luxury hotel is Tashi Delek but the family-run Hotel Nor-Khill, former guesthouse of the Chogyal, is arguably the city’s best. Tibet Hotel has the best food, though, while Rendezvous, in the medium range, is centrally located. In Lachung, your hotel (most are basic) depends on the tour operator you choose. Blue Sky Tour & Travels’ Lachung establishment Le Coxy is perhaps the best. Season: If it’s your first visit to Sikkim, November-December is the best season. Though cold, it’s when the weather is mostly clear; even the most beautiful mountains can look dull in overcast conditions. March-April is great for snow views but May-June is when the rhododendrons and primulas are in full floom. Avoid the mid-June-to-September rainy season. Visit Yumthang only in the morning when the sun falls on the snowy western range. At places, the road was covered with snow, a foot or two of it, and our vehicle had to go into four-wheel drive. Steep jagged mountains soared into the deep blue sky, contrasting with icy whiteness of the slopes and its strangely red boulders. Down below, the Yumthang Chu cut a narrow channel through the thick ice. We played like children in the snow, throwing snowballs at each other, rolling on the icy surface. We couldn’t reach the very end of the Yumi Samdong road however; a bulldozer, apparently out of order, blocked the way. Back in Lachung by lunchtime, we visited the village monastery in the afternoon but it was closed. Monks of the Tibetan Nyingma sect, to which Lachungpas belong, aren’t celibate and do not keep the shrines open all day, we were told. On the journey back next morning, I readied my camera long lens to photograph the picturesque farmlands below the road, on the mountain slopes near Lachung. Lit by shafts of slanting sun, the patches of bright green crop, the wicket fences and log huts look stunning against the dark backdrop of the hills opposite. Eventually we reached Chungthang (23 km from Lachung) where the Yumthang Chu meets the Teesta. It’s a road tri-junction too, with one route following the Teesta river northward to Lachen and the Tibetan border beyond. Beyond Chungthang, which has a large military garrison, the road south follows the green Teesta river, through deep valleys and gorges, past magnificent waterfalls before reaching Singhik from where, on a clear day, the east face of Kanchenjunga is clearly visible. Close by is Mangan, the north district’s headquarters and ringed with cardamom plantations. The villages here are mostly inhabited by Lepchas, Sikkim’s oldest peoples — animists who may have migrated from Assam, but are now reduced to a minority. The majority community in the state today are the Nepalese who live mainly in the south and vastly outnumber the Bhutias. Stopping for lunch at Phodong and taking time off to see its monastery, we finally made it to Gangtok by late afternoon amidst a heavy shower. A damp gray ending, alas, to an incredible, extraordinary tour.